Firms ‘struggling to recruit as overseas staff stay away’ But Samuel Tombs, an economist at Pantheon Macroeconomics, says wages will “struggle” to accelerate much further………………….”Flows of people out of self-employment and into employee roles have remained strong, ensuring that record-high job vacancies don’t lead to spiralling wage growth,” he said. The ONS noted that the decline in workers from eastern European countries was “accelerating”, while there had been an “uptick” in British nationals in work. 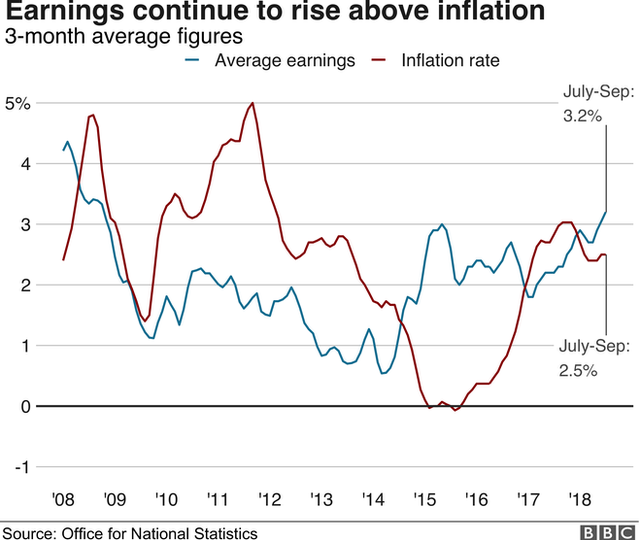 The unemployment rate went up to 4.1% from 4.0% in the period from July to September…………….Two reasons largely accounted for this – the rising population in the UK and an increase in the number of men out of work………………”Job creation since May has averaged just 2,900 a month. This slowdown in the number of new jobs opening up is likely to feed through into weaker consumer spending in the coming months,” said Mike Jakeman, senior economist at PwC. What has happened to the number of EU workers? Analysis by economics correspondent Andy Verity: You might well have expected it to happen………………The prospect of Brexit and the weak pound seems to have put off some migrants from coming to the UK to work, while others have decided to return to their country of origin. …………………Now we have the strongest evidence so far of that trend – with the number of EU nationals working in the UK falling by 132,000 in the three months from July to September compared with the same period a year before. While migrant workers coming from the rest of the world grew by 34,000 there is still a net outflow of migrant workers: And it is particularly striking when you focus on the so-called EU 8 – Cyprus, Czech Republic, Estonia, Hungary, Latvia, Lithuania, Malta, Poland, Slovakia and Slovenia………………..Based on ONS calculations, the number of workers in the UK from those countries (as opposed to more recent joiners such as Bulgaria and Romania) are down 173,000 from the record high of 1.05 million two years ago. Suren Thiru, head of economics at the British Chambers of Commerce, said the UK’s impending departure from the European Union had played a part in the rise in the number of people out of work: He said it suggested that “the UK jobs market may be starting to falter under the weight of persistent Brexit uncertainty and chronic skills shortages”. The Recruitment and Employment Confederation highlighted what it said was a record number of job vacancies of 845,000 from August to October – the highest since comparable records began in 2001: Director of policy Tom Hadley said employers were “continuing to experience fundamental challenges in finding the staff and skills that they need”………………These skills shortages would “further intensify over the next few months as EU workers no longer find the UK an attractive place to work”, he added.